Who looks at a fork and says "Oooh, this could be a little more sonic!"? Someone at the BBC, unfortunately. Even the good Doctor needs a nice set of cutlery that's in keeping with his hard-earned image. That's where this Doctor Who Cutlery Set comes in. 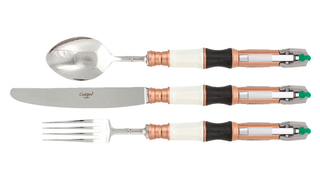 Dine like a Time Lord with your very own fork, knife, and spoon modelled after Doctor Who's Sonic Screwdriver! What a truly bizarre world we live in. These bits of merchandise are currently exclusive to the US and Australia, and can be pre-ordered via Entertainment Earth.